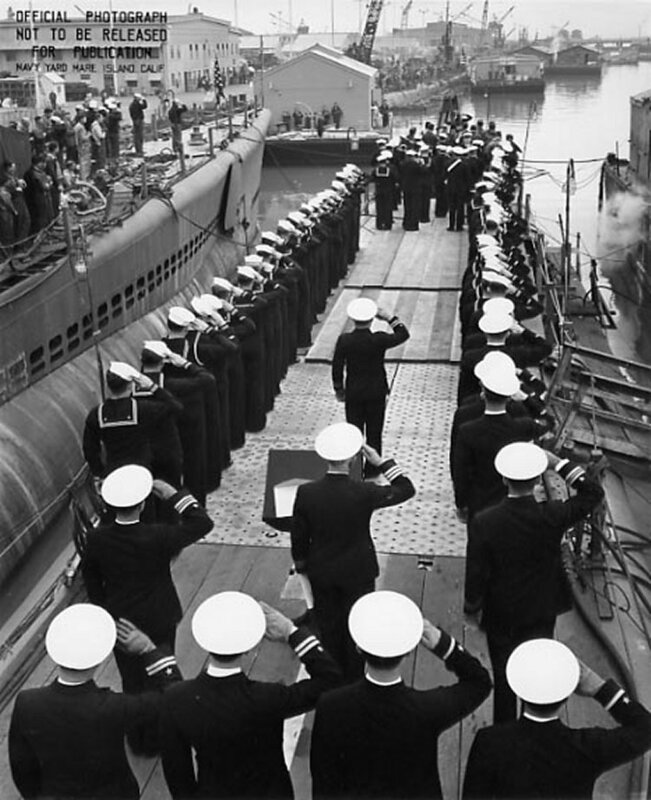 Sargo Class Submarine: Laid down, 12 May 1937, at Electric Boat Co., Groton, CT.; Launched, 6 June 1938; Commissioned, USS Sargo (SS-188), 7 February 1939; Decommissioned, 22 June 1946, at Mare Island Navy Yard, Vallejo, CA. 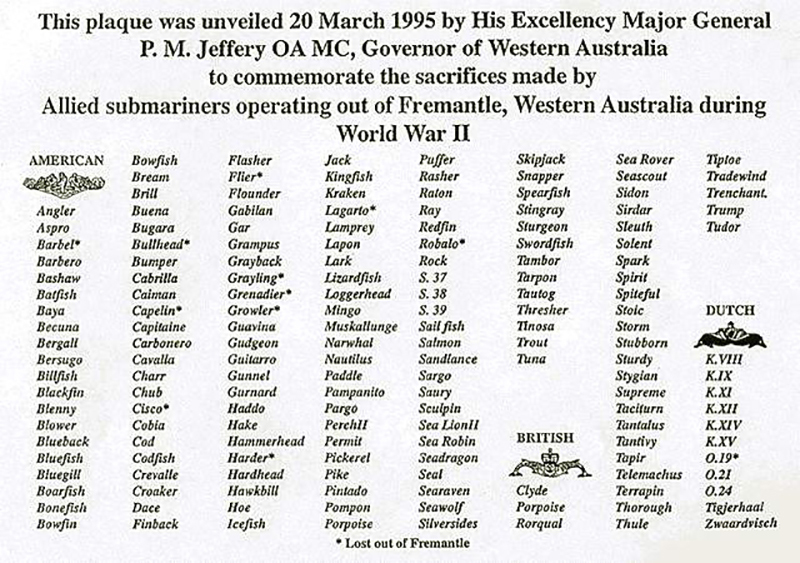 ; Struck from the Naval Register, 19 July 1946; Final Disposition, sold for scrapping, 19 May 1947, to Learner Co., of California. Sargo was awarded eight battle stars for her service in World War II and received the Philippine Presidential Unit Citation. 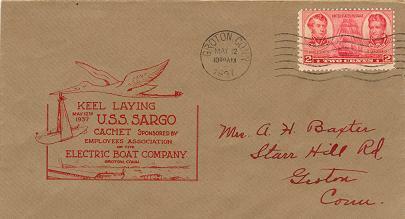 16k Commemorative post mark on the occasion of the Sargo's (SS-188) keel laying, 12 May 1937, at Electric Boat Co., Groton, CT. Courtesy of Jack Treutle (of blessed memory). 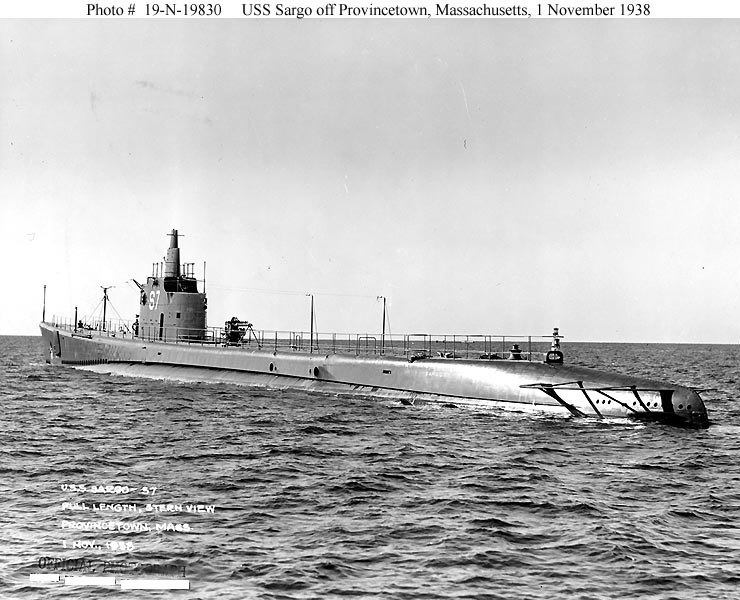 69k Sargo (SS-188) underway at 18.8 knots while running trials off Provincetown, Massachusetts, 1 November 1938. USNHC photo # NH 19-N-19793 from the collections of the US Naval Historical Center. Photograph from the Bureau of Ships Collection in the U.S. National Archives. 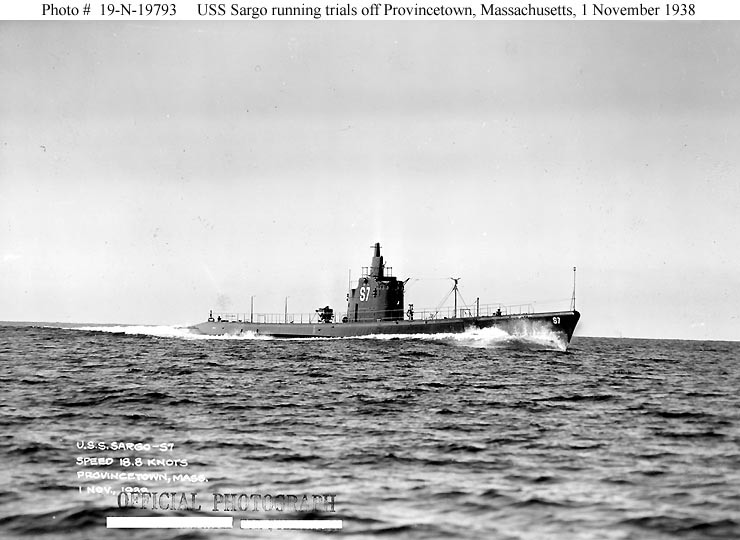 98k Sargo (SS-188) off Provincetown, Massachusetts, during her trials, 1 November 1938. USNHC photo # NH 19-N-19830 from the collections of the US Naval Historical Center. Photograph from the Bureau of Ships Collection in the U.S. National Archives. 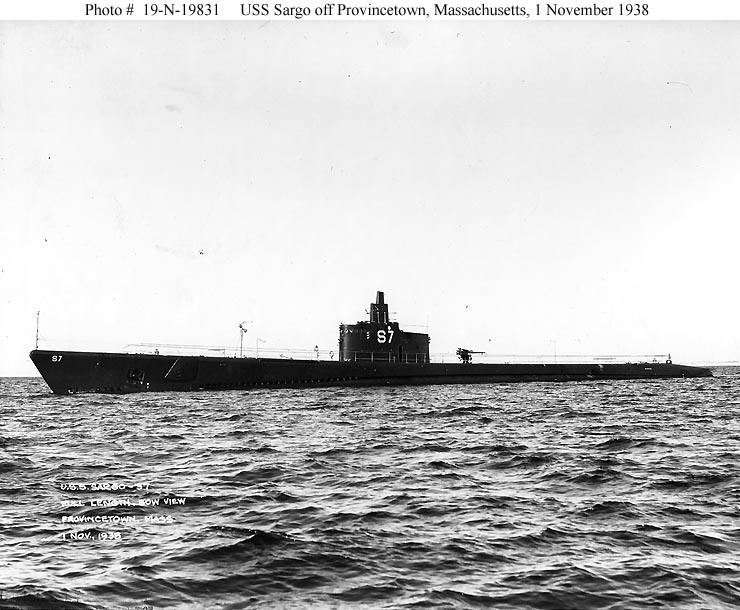 96k Sargo (SS-188) off Provincetown, Massachusetts, during her trials, 1 November 1938. USNHC photo # NH 19-N-19831 from the collections of the US Naval Historical Center. Photograph from the Bureau of Ships Collection in the U.S. National Archives. 133k Sargo (SS-188) probably photographed shortly after commissioning, circa 1939. USN photo courtesy of ussubvetsofworldwarii.org. 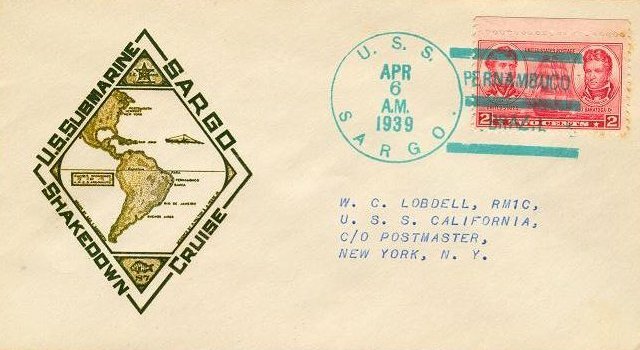 51k Commemorative post mark on the occasion of the shakedown cruise of the Sargo (SS-188), 6 April 1939. Courtesy of Jack Treutle (of blessed memory). 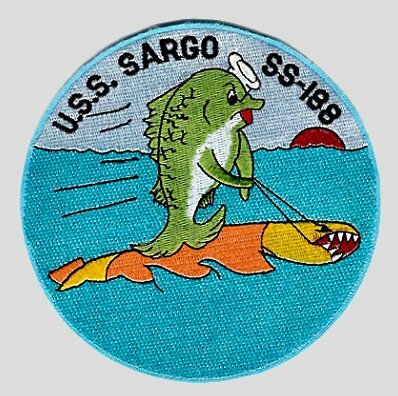 NR UNDERSEA VISITOR—The United States submarine Sargo (SS-188), is shown today docked at the Navy Yard, where she arrived yesterday. Her commanding officers are (inset) Lt. Comdr. E. E. Yeomans of Indiana (left), and Lt. R. W. Johnson of New York. Image and text provided by Library of Congress, Washington, DC. Photo & text by Evening Star. [volume] (Washington, D.C.) 1854-1972, 28 September 1939, Image 25, courtesy of chroniclingamerica.loc.gov. 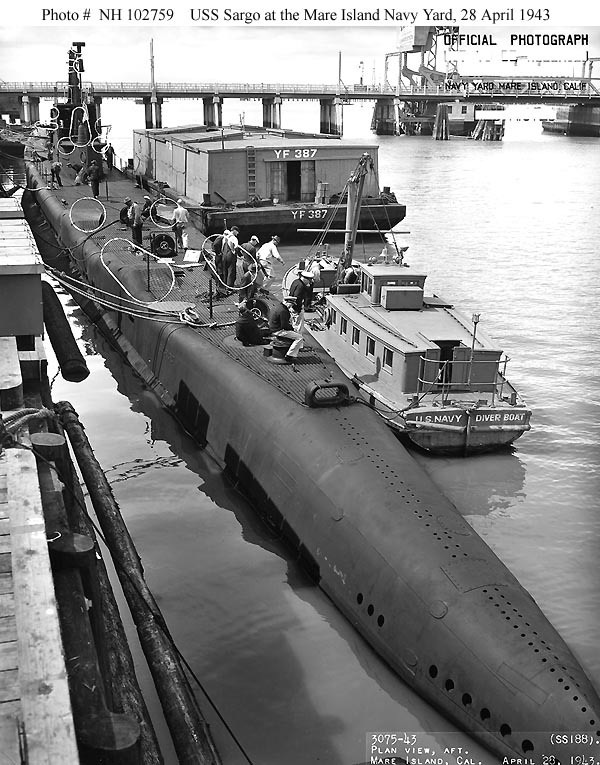 1.00k Condition of Sargo's (SS-188) bottom prior to a paint job at the Mare Island Navy Yard, California, July 1941. USN photo # MI-1647-41 courtesy of Scott Koen & ussnewyork.com. 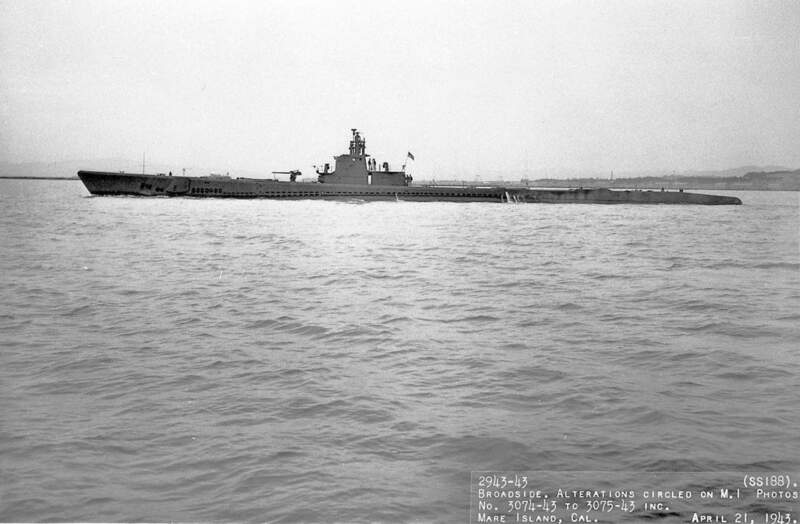 51k Bow on view of the Sargo (SS-188), underway off the Mare Island Navy Yard, California, 21 April 1943. Official USN photo # NH 102756 from the collections of the US Naval Historical Center. 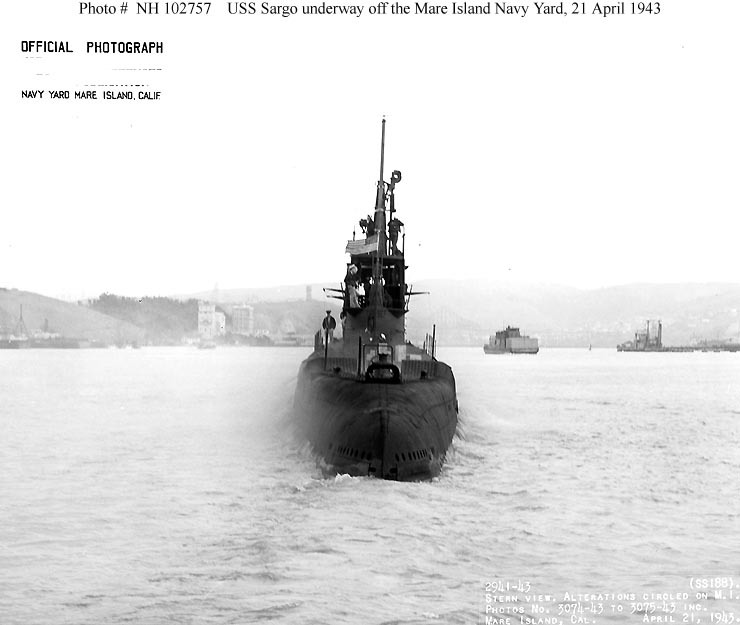 168k Broadside view of Sargo (SS-188) off Mare Island Navy Yard on 21 April 1943. 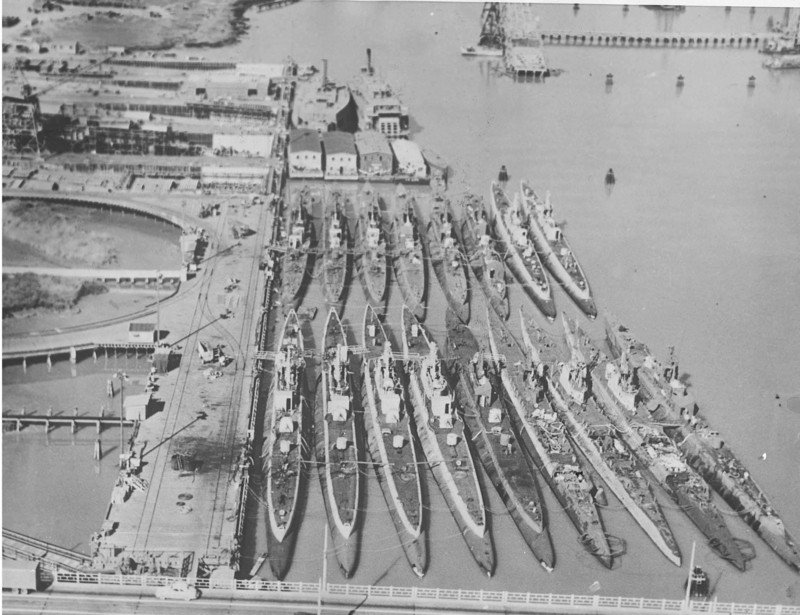 Official Mare Island photo # 2943-43, from the Vallejo Naval & Historic Museum & submitted by Darryl L. Baker. 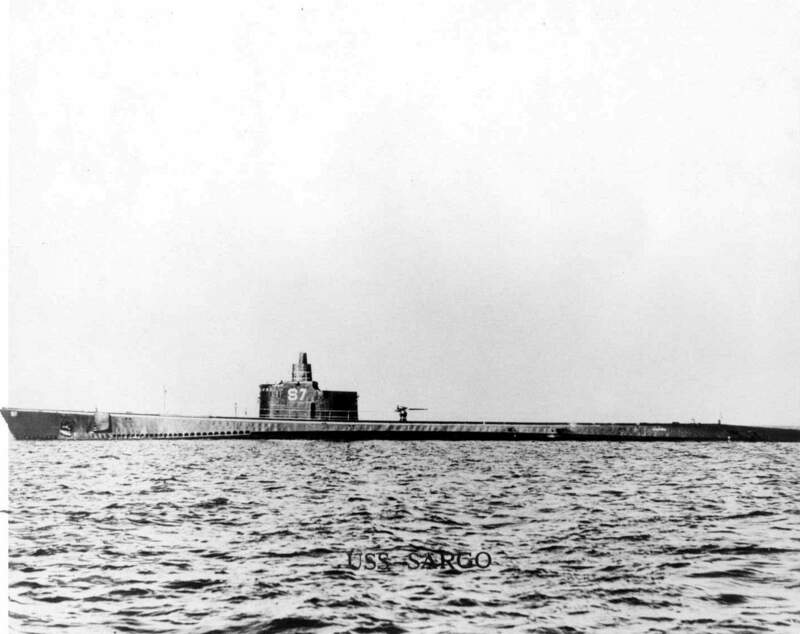 51k Sargo (SS-188) seen from astern while underway off the Mare Island Navy Yard, California, 21 April 1943. Official USN photo # NH 102757 from the collections of the US Naval Historical Center. 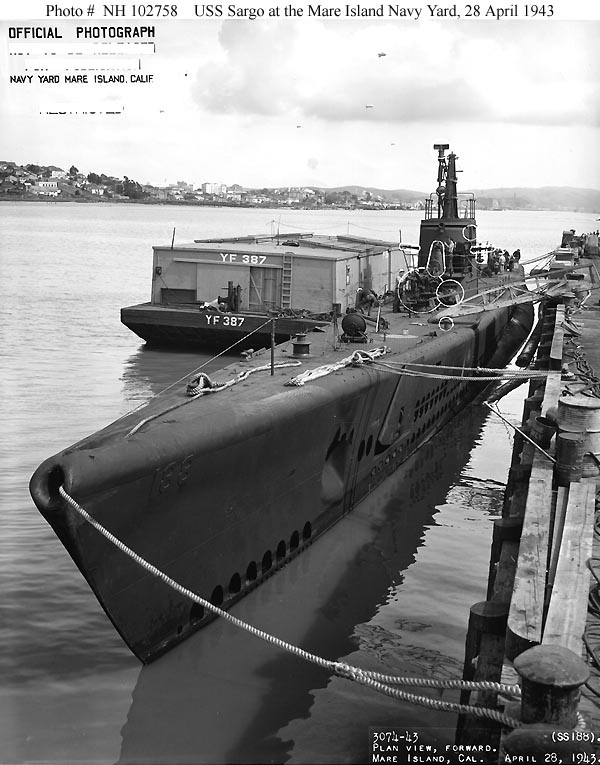 92k Sargo (SS-188) at the Mare Island Navy Yard, California, 28 April 1943. Covered lighter YF-387 is alongside. White outlines mark recent alterations to Sargo. Note barrage balloons in the distance. Official USN photo # NH 102758 from the collections of the US Naval Historical Center. 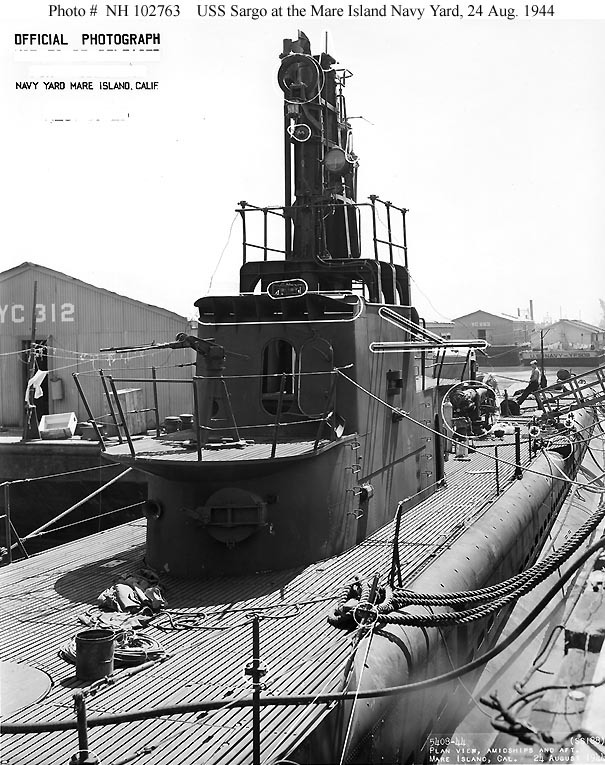 121k Stern view of the Sargo (SS-188) at the Mare Island Navy Yard, California, 28 April 1943. Covered lighter YF-387 and a diving tender are alongside. White outlines mark recent alterations to Sargo. Official USN photo # NH 102759 from the collections of the US Naval Historical Center. 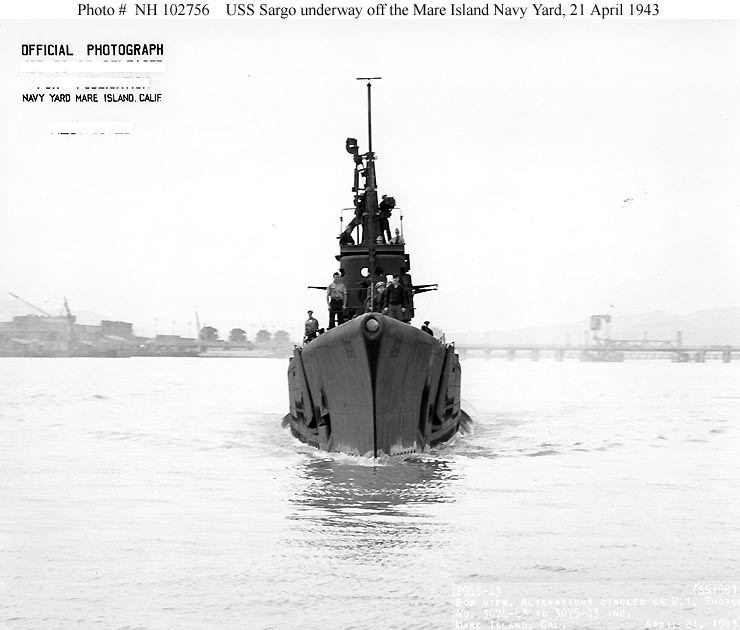 132k The National Ensign raised aboard the Skate (SS-305) at Mare Island Navy Yard on 15 Apr 1943. 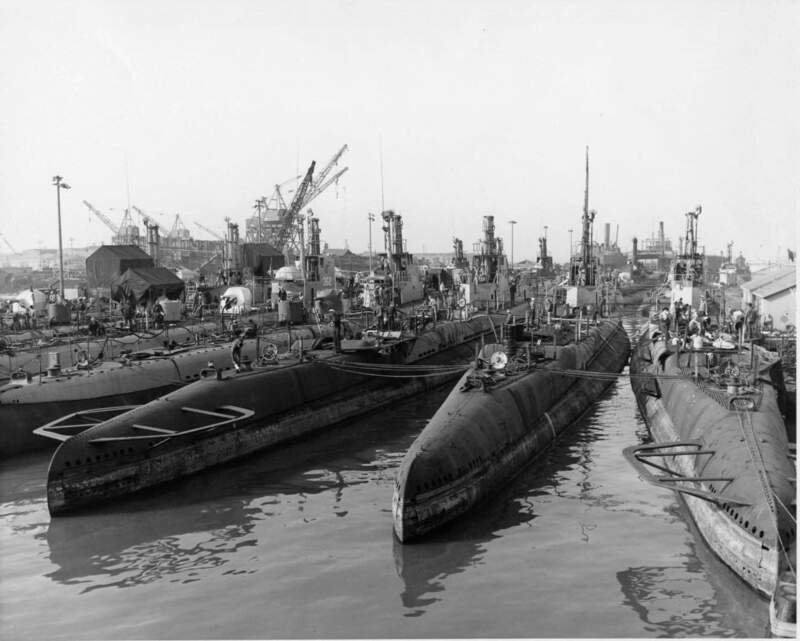 The Seahorse (SS-304) is the submarine to the left and Sargo (SS-188) is the submarine between the barges forward of Skate. USN photo 2651-4-43,courtesy of Darryl L. Baker. 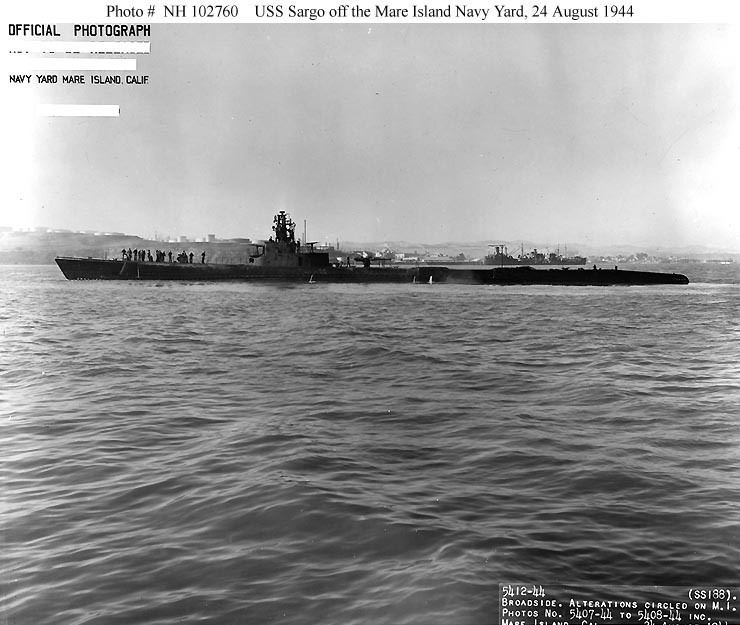 74k Sargo (SS-188) off the Mare Island Navy Yard, California, 24 August 1944. Note lookouts in the upper superstructure. Official USN photo # NH 102761 from the collections of the US Naval Historical Center. 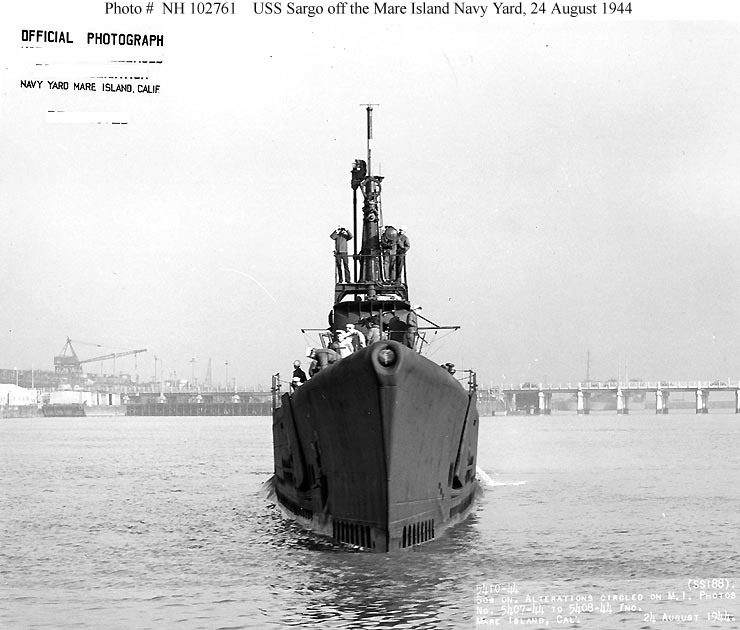 82k Sargo (SS-188) off the Mare Island Navy Yard, California, 24 August 1944. Official USN photo # NH 102760 from the collections of the US Naval Historical Center. 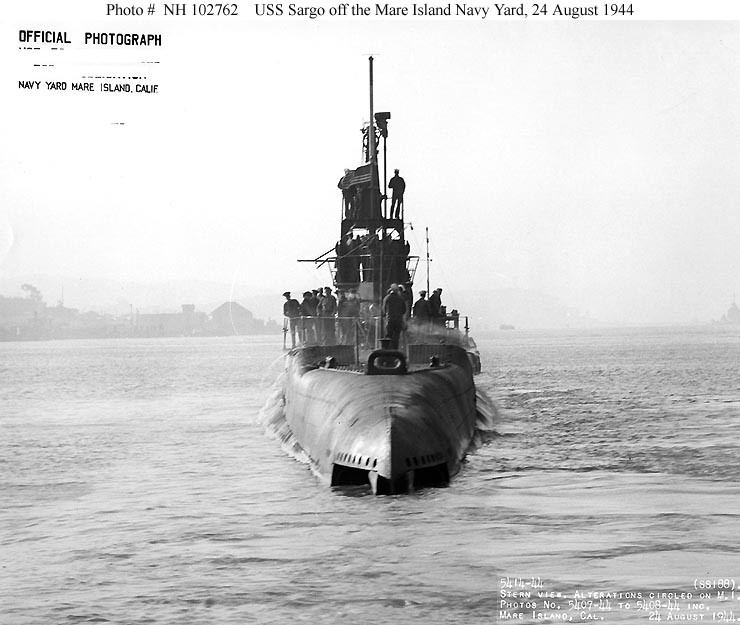 72k Sargo (SS-188) seen from astern while off the Mare Island Navy Yard, California, 24 August 1944. Official USN photo # NH 102762 from the collections of the US Naval Historical Center. 136k Plan view of the Sargo (SS-188) amidships, looking aft, while she was at the Mare Island Navy Yard, California, 24 August 1944. Barge YC-312 is alongside, and YC-293 and YF-509 are in the right distance. White outlines mark recent alterations to Sargo. Official USN photo # NH 102763 from the collections of the US Naval Historical Center. Unknown, Dragonet (SS-293), Guavina (SS-362), Sunfish (SS-281), Sargo (SS-188), Spearfish (SS-190), Saury (SS-189). 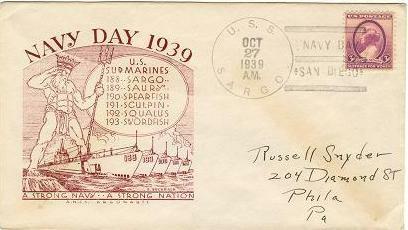 First two ships in second row appear to be: Bashaw (SS-241) and Mingo (SS-261). The Tiru (SS-416) is on the building ways on the left above the subs and surrounding by staging and cranes. It is interesting to note that the boats have started the mothballing process, as evidenced by the preservative cocoons around the deck guns. USN photo courtesy of Darryl L. Baker. Partial text courtesy of David Johnston, USNR. 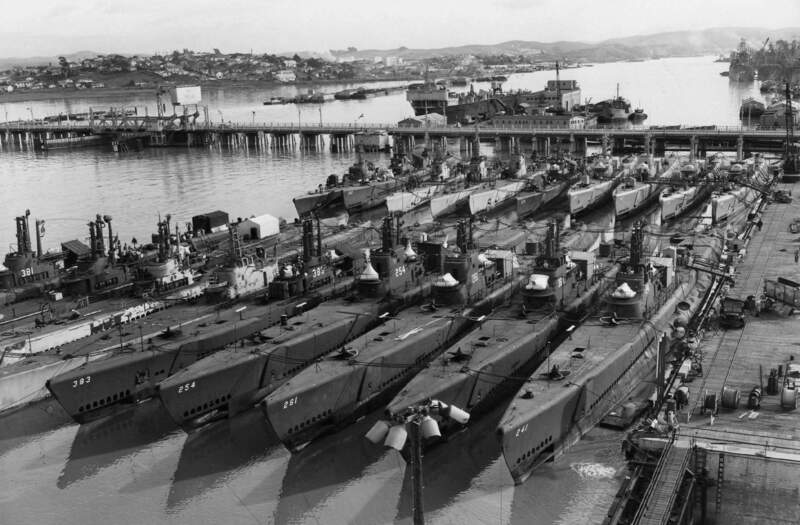 Back row left to right: Unknown, Tunny (SS-282), next three could be Sargo (SS-188), Spearfish (SS-190), and Saury (SS-189), Macabi (SS-375), Sunfish (SS-281), Guavina (SS-362), Lionfish (SS-298),Piranha (SS-389). The mixture of boats from the Salmon/Sargo, Gato, and Balao classes illustrate the clear differences in the conning tower fairwaters and the periscope shears that can be used to identify boats. The high bridges with the uncovered support frames (the "covered wagon" look) of the Gatos and Salmon/Sargo's contrast with the low and sleek look of the Balao's. The fatter, more robust periscope shears of theBalao's are markedly different from the thinner shears with more supporting structure of the Gatos and Salmon/Sargo's. The differences in the pattern of the superstructure limber holes can also be used for identification purposes. The single row of large semi-circular holes indentify Electric Boat or Manitowoc boats. A dual row of smaller rectangular holes mark the government built boats. Also note that the EB/Manitowoc boats have the deck mounted, T-shaped JP sonar head on the starboard side of the forward deck, while the government boats have it on the port side. Most of the boats have the late war radar outfit of the SJ surface search (small dish) and SV air search (large dish). The Balao's and some of the Gatos have the SS dish mounted on a separate large mast aft of the periscopes. The older Salmon/Sargo's and Gatos have a much smaller mast. Searaven appears to have had her radars already removed. One strange thing: almost all of the boats appear to have the outer doors of the forward torpedo tubes open. Even though the boats have an interlock system that prevents the breech and outer doors from being opened at the same time, this is an unusual thing to do and a potential source of catastrophic flooding. USN photo # 17-46, courtesy of Darryl L. Baker. Text courtesy of David Johnston, USNR. 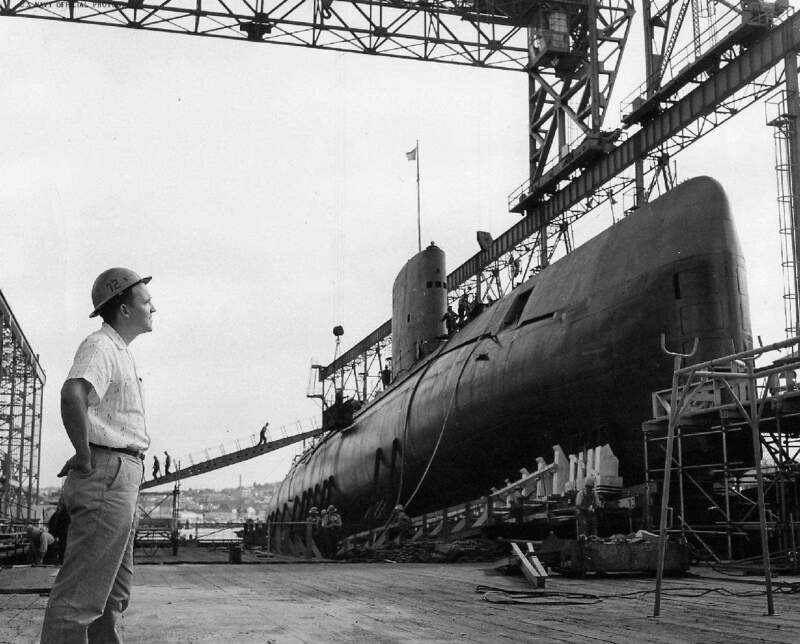 182k Allen Bullock, a former crew member of Sargo (SS-188) views the Sargo (SSN-583) on the building ways at Mare Island on 8 October 1957. USN photo # NY9 36929-10-57, courtesy of Darryl L. Baker.